(CNN) -- An influential adviser to the U.S. commander in Afghanistan declared Friday that anything less than 25,000 extra international troops in the country would not be enough to win. A bomb exploded in Kabul on the corner of Passport Lane and the Indian Embassy Thursday. David Kilcullen, who also advised U.S. commanders in Iraq, told CNN's Christiane Amanpour the window of opportunity to turn around the war is closing. Kilcullen's comments came as President Barack Obama, only hours after being awarded the Nobel Peace Prize, again met with his top advisers to discuss strategy and troop levels in Afghanistan. The U.S. commander in Afghanistan, Gen. Stanley McChrystal, is reportedly asking for up to 40,000 extra troops. Some reports say there is an option on the table to send 60,000 additional troops, almost doubling the U.S. force now in the country. Kilcullen, who has just come back from Afghanistan -- said the Obama administration needs to finish the strategy review as soon as possible. While the war is not as bad as some say, "it's worse than any other time in the past," he said. He identified three critical problems in Afghanistan: the lack of legitimacy for the government, the existence of safe havens for terrorists across the border in Pakistan, and the lack of military resources. He said it will not be possible to protect the Afghan population -- the key to any counterinsurgency strategy -- without a substantial input of additional resources. 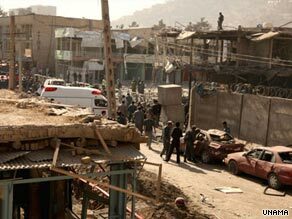 Security in major population centers in Afghanistan is vital, Kilcullen said, as the perceptions of the Afghan people are critical to turning around the war. "People are angry at the coalition sometimes, not because we are there, but because we are not providing security," he said. Nothing else will matter if the counterinsurgent forces do not control the environment, he asserted. It also is critical to end the corruption that feeds the violence, he said. Corruption creates anger and bad government, which creates space for the Taliban, which in turn leads to poppy cultivation across the country, he said. That floods the country with money, which creates even more corruption. But Kilcullen spoke positively about some aspects of the efforts to defeat the insurgency. He said he has never seen a better leadership team in the International Security Assistance Force, the U.S. military, and the American Embassy. In addition, he said, the Afghan military has improved, though he noted there are still problems with the Afghan police. In Kilcullen's view, the biggest problem is with the civilian leadership in Afghanistan.